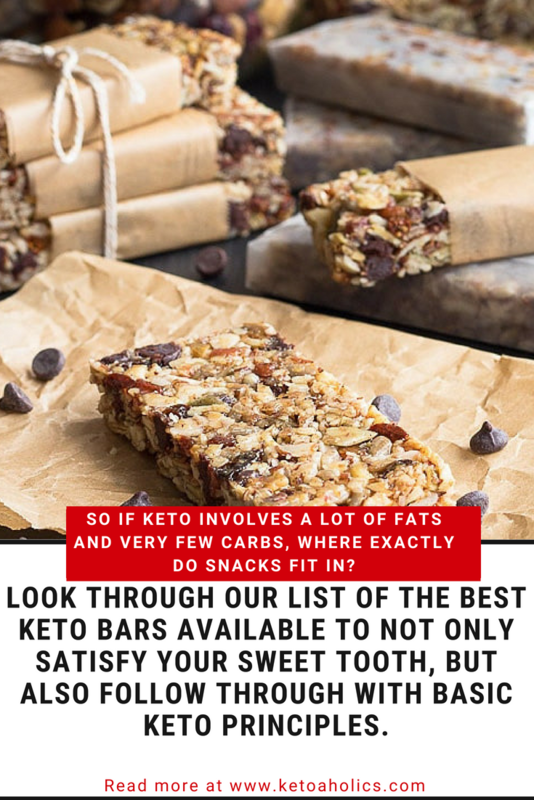 →Best Keto Bars Review: What Do You Need to Know? So if keto involves a lot of fats and very few carbs, where exactly do snacks fit in? Many people face this question and may even give up the idea of keto before actually trying the diet. But worry not. With some creative creations, you can now look through our list of the best keto bars available to not only satisfy your sweet tooth, but also follow through with basic keto principles. This bar is low in carbs, making it suitable for a ketogenic diet. In addition to that, it contains 12 essential vitamins needed by the body. It’s a simple combination of taste with healthy nutrition. With a peanut butter flavor, these bars are a delicious snack for anyone on the keto diet. But if you’re not a fan of peanut butter then there’s also a Chocolate Black Cherry available as well. The total carb content of this keto bar is only 2 grams. The bar contains no traces of sugar. Also, it contains soy proteins which makes the bar healthier as these proteins are involved in improving bone and heart health. 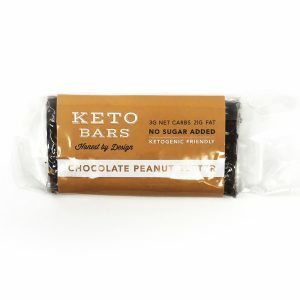 Customers loved the fact that they can use these bars as meal replacement when they feel hungry in the middle of the day. Many customers also commented that the high protein content makes these bars quite healthy. 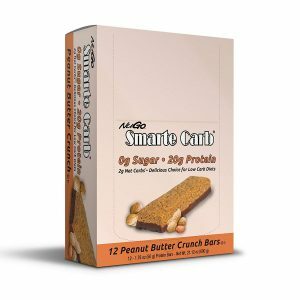 Also, there is very little carb content, which makes these bars quite useable for those on the keto diet and diabetic patients. The second keto bar on our best keto bars review is the One Protein Bar. With this friendly protein bar, you can enjoy guilt-free snacking whenever your taste buds are feeling a little excited. It contains only 1 gram of sugar while being super rich in protein. The protein count for each bar is 20 grams. It is gluten free and can be combined with any healthy diet. The variety pack by this brand gives you 4 delicious flavors to choose from. Satisfy your craving with mouth-watering flavors like Birthday Cake, Blueberry Cobbler, Maple Glazed Doughnut and Salted Caramel. Whether you are late for work or you just feel like your sweet tooth is bothering you, this snack can keep you going through the day. You can indulge in this snack while on a keto diet as it only contains 1 gram of sugar and zero regrets in each bar. Whether it is the subtle taste of fruity goodness, the bold taste of salted caramel or the pure bliss of cakes or doughnuts, these bars are made to satisfy your taste buds. In all, the brand offers 12 delightful flavors to choose from. Customers who are loyal to this brand have ranked their products as better than the competition in terms of taste and texture. 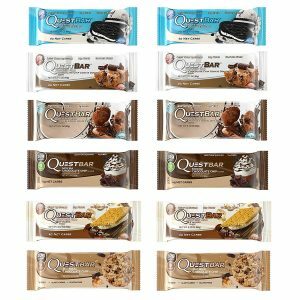 Quest bars are the next bars in our keto friendly snack bars review. They taste delicious while ensuring nutritional integrity. Each bar contains less than 7 grams of carbs while having a whopping 20 grams of protein. Another great feature of this bar is that it contains 13 grams of dietary fibers. Such a high fiber count ensures better functioning of the digestive system and lesser problems in the GI tract. In all, the Quest brand offers more than 20 unique flavors to satisfy your taste buds. While you can also get individual flavors, the variety pack brings together the best of all tastes offering six different flavors. These bars have over 1,000 reviews and most of them have rated 4 or above four stars. The older reviews on Amazon about these bars are quite positive as the customers found them healthy and delicious. However, some negative reviews started to come in when the company changed their formula. For anyone looking to satisfy their sweet cravings on the keto diet, these bars are a must-try. They come with a high fat, moderate protein and low carb content with no added sugars. These bars are available in two flavors, namely Dark Chocolate Coconut and Chocolate Peanut Butter. And the best thing is that the bars contain exactly that. There isn’t a host of processed ingredients to add to the flavors but the manufacturers have kept things simple by using the most basic and natural ingredients. Every bar yields an impressive 18 grams of fat, 7 grams of protein and 2 grams of net carbs. Despite the inclusion of dark chocolate in every bar, the taste is not too bitter as the manufacturer has used Stevia to balance the bitterness. You can also enjoy the goodness of nuts and some fruit in these bars and the addition of butter and heavy cream makes the bars chewy and moist. Customers have likened the taste of these bars similar to that of a brownie or fudge without all the carbs. 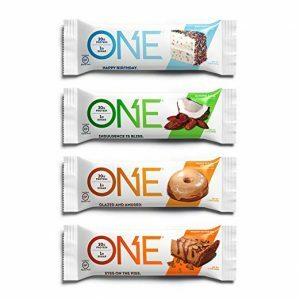 Of these four bars, we recommend that everyone on the keto diet try out Keto Bars. These bars are made using only natural ingredients and deliver the right amount of nutrients as required by the keto diet. There is an abundance of fats, only so much protein and very few carbs. The problem with most bars is that being low carb bars, they also become high protein. But that is not a requirement for achieving ketosis. Keto Bars do not do this as can easily be recommended as the winner in this list of the best keto bars review.